A nostalgic throwback to the early 80s era of the slasher film, My Bloody Valentine was the first modern horror film to fully embrace the new 3D craze, shocking its audiences with realistically realized axes and body parts shooting from the screen, as well as with all manner of grisly and gruesome special effects to bring the bloody story to life. A remake of the 1981 classic horror film of the same name, the film is directed by Patrick Lussier and stars Jensen Ackles as Tom Hanninger, a young man who returns to his Pennsylvania mining hometown on the tenth anniversary of the Valentine’s night massacre that claimed the lives of 22 people. Despite the original murderer having been apparently killed a decade a go, the murders begin again, and before long Tom finds himself being accused of the crimes. Turning to his old girlfriend Sarah (Jaime King) – who survived the massacre a decade before – Tom sets out to solve the brutal mystery and prove his innocence. 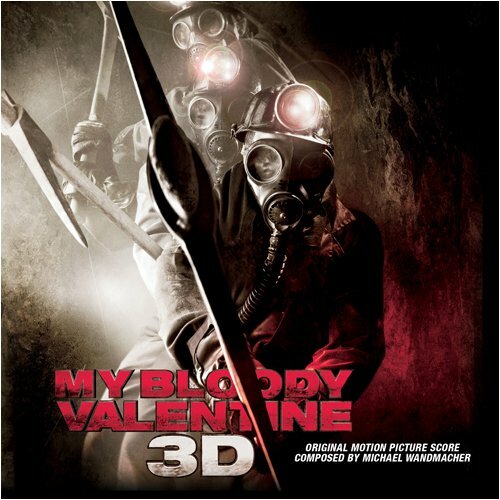 The music for My Bloody Valentine is by composer Michael Wandmacher, whose career on the fringes of the Hollywood mainstream has seen him write the scores for films such as Never Back Down, Punisher: War Zone, several re-dubbed Jackie Chan films, and the American Idol spin-off movie From Justin to Kelly. Wandmacher’s music is a prototypical modern horror score, written for a big orchestra and big electronics, that powers and thunders its way through several rampaging cues; the one thing this score is not is subtle. There’s no real main theme to speak of, but My Bloody Valentine isn’t really that kind of score; instead, it’s all about momentum, energy and creating a thick, oppressive atmosphere, and on these terms Wandmacher has succeeded fairly admirably. Cues such as “Left for Dead”, “Be Mine 4Ever” have an excellent rhythmic element, relentlessly moving forward with huge brass clusters and enormous percussive force, much like the ruthless killer the music accompanies. Some of the string dissonances are clever, whining and groaning in the top regions of the register, and some of his instrumental combinations are interesting, but for far too much of the album’s running time the score gets bogged down in fairly standard thriller and suspense music, doing little more than present ambient synth lines augmented by occasional orchestral stingers for minutes on end – “Cage Match” and “Dental Work” are prime examples of this. At the other end of the spectrum, “Prodigal Son” introduces a melancholy, slightly skewed, but nevertheless attractive contemporary piano theme for Tom that eventually becomes a decent soft rock instrumental, and provides a welcome change of pace; the style is repeated in cues like “A Troubled Conversation’ to equal effect. Fans of Marco Beltrami are sure to find much to enjoy in this score, as Wandmacher’s style is similar to that heard in some of Beltrami’s darker scores, and it’s nice to see a composer on the fringes of the mainstream score a fairly major box office hit – the movie grossed over $50 million at the US box office. Unforunately, the score for My Bloody Valentine was never released commercially in stores, but is available as digital download or through Amazon’s ‘CDR On Demand’ program.